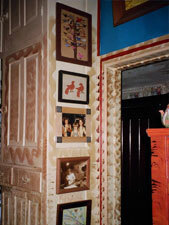 Family photographs and paintings by generations of Strawsers adorn the walls of the home of folk artist Barbara Strawser. This photograph of geese in winter was a featured painting at Boyertown's 2006 Coming Out of Hibernation Festival during the Strawser Bertoia Bertoia Strawser Four Artists, Four Seasons show held at TK Productions Studio on East Philadelphia Avenue and Washington Street . The activities and simple joys of women in rural Pennsylvania comprise the subject matter in much of the work of folk artist Barbara Strawser. Enjoy the close up view of Homebody Bear's lovely face: what beautiful eyes, such ruby lips! Every home enjoys flowers in the windows and a tree or two in the yard. Homebody Bear shows its homey greenery. 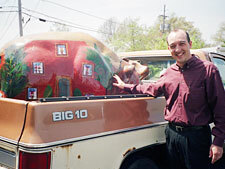 Matt Kennedy of Glocker Real Estate stands proudly beside Homebody Bear, the real estate's newest mascot. Paul Stahl and Matt Kennedy decide on the perfect position for Homebody Bear. Pictured with the logo bear are Jeff Graber, artist and sponsor of the Bear Fever bear, and Elise Sherman, student at BASH who adopted our logo bear, interviewed Jeff, and wrote about him so others in our community would know more about him and his bear. 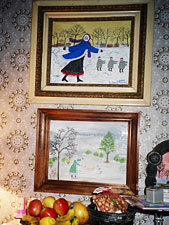 Several paintings gracing the walls of folk artist Barbara Strawser's home illustrate favorite winter activities of women and children in rural Pennsylvania. 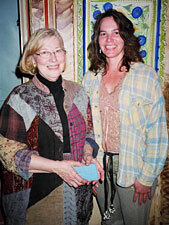 (left to right) Mother Barbara and her daughter Melissa pose for a picture in Barbara's home, a work of art in itself. 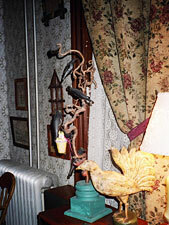 The home of folk artist Barbara Strawser is a work of art in itself favoring symbols of a simple life in the country. 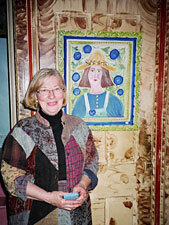 Folk artist Barbara Strawser stands beside a self portrait in her home in Schaefferstown. 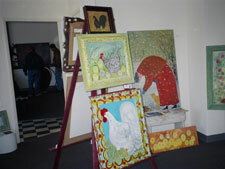 Paintings of folk artist Barbara Strawser were displayed at Boyertown's 2006 Coming Out of Hibernation Festival The art of mother and daughter Barbara and Melissa Strawser and brother and sister Val and Lesta Bertoia at their Four Artists, Four Seasons show held at TK Productions Studio on East Philadelphia Avenue and Washington Street attracted dozens of fans and patrons of the artists including Reading philanthropist and businessman Albert Boscov. “He likes me! He really, really likes me!” Matt Kennedy of Glocker Real Estate wears a proud smile for Homebody Bear. Our Boyertown Office located at the corner of Rt. 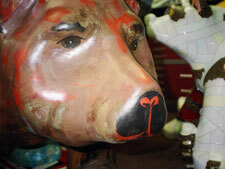 100 and Philadelphia Ave. is proud to be the home of the new Barbra Strawser “House” bear. Our five full time agents have worked and lived in the Boyertown area for several years and are excited to be a part of this community project. We hope that the addition of this attractive piece of art work to our location will be enjoyed by residents and visitors that pass by. 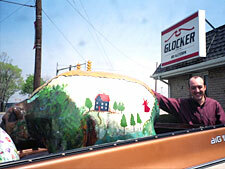 Glocker & Company Inc. has a long history of serving the real estate needs of the Boyertown community. Starting in 1968, founder and active president Karl Glocker opened his first office in the Spring Ford area as a one-person operation with a part-time secretary. By 1970 Karl expanded the business to two additional offices in North Coventry and Boyertown. Today we have 17 full time agents, several clerical and support staff. We also have an in-house insurance broker, Doug Kutz, who provides home, auto and medical insurance services. 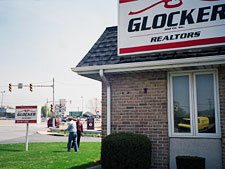 To learn more about the services we provide to Sellers, Buyers, and the Community please visit our website at www.glocker.com . Ms. Strawser's interests include painting, gardening, cooking, and learning. Her painting is her profession. Ms. Strawser takes her work to shows all over the east coast. One show that she frequently visits is the Kutztown Folk Festival. She goes there every summer. Ms. Strawser also enjoys gardening and cooking. When she cooks and bakes, she likes to experiment with different recipes. She loves learning new things and trying them out. Ms. Strawser's friends would describe her as a person who is very connected to the Earth, someone who loves everything on the Earth. She especially enjoys all of the seasons of the year and when they change from one to another. She also is known as someone who loves to garden, cook, and paint. This talented woman loves to paint. She taught herself to paint at the age of 15 and has been painting ever since. 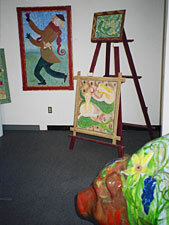 Her paintings display what she calls â€œfolk art style.â€  Most of her works consist of women in gardens, or performing chores and tasks that were common in times past. 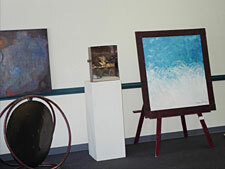 There are also some of her paintings that are inspired by things that she has witnessed personally. For instance, she has a beautiful picture of a woman feeding birds which was a scene that she had come upon in Connecticut one winter. Ms. Strawser is very creative also in the way that she displays her work. She has paintings that are framed by windows, and even antique doors. Another talent of Ms. Strawser's is gardening. Her house and gardens are filled with plants and flowers of all kinds. She also enjoys growing vegetables and using them in her cooking. Ms. Strawser has a few personal goals. She would like to be able to continue her work for her whole life. She has a illustrated one mini-book for a publishing company called Running Press. And she is also interested in illustrating more children's books and maybe even writing one of her own someday. The book would be about making kids more aware of the changing seasons and each one's beauty. 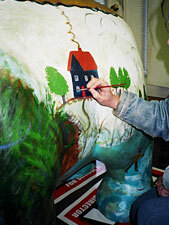 A major mission in Ms. Strawser's work is painting her world for others to see. She wants to make others aware of the great beauty that she sees in the world. She wants her paintings to make people happy, and she wants her work to stay fresh and new. She wants her work to be different and varied. She wants to be remembered as someone who found something that she loved as a young teenager and taught herself. Her painting is her passion. She taught herself how to paint since she was 15 years old. She began selling her work at the age of 20 and has made a living out of something that she has always wanted to do. It's something she loves. Ms. Strawser got involved in this project through her daughter Melissa. Her daughter told Mrs. Stahl that her mother was an artist. There were also people who saw her work in the area and liked it. She believes that she will benefit from Bear Fever because it's good to put your work out there, wherever you can put it. Ms. Strawser believes that Bear Fever is good because it is a fun thing for everybody to get involved in our area. There were similar things that were done in Harrisburg and Chicago , and now it is happening in our own community. Something like this breaks the routine of a community. She believes that spring is a good time to do this because spring is a good time to do something new. She also thinks that it is a fun thing to get kids excited about. She hopes that this does provide a nice thing for the community to unite around. This should be something that the members of the community work together on to look at things differently. An admirer of Mrs. Strawser's work heard that she was doing a bear for the Bear Fever project and wanted immediately to buy her bear. 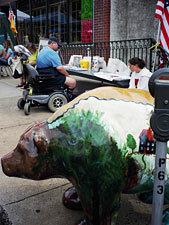 Boyertown's Bear Fever project, unlike many other public art projects of this kind, does not maintain ownership of the bears. In Boyertown's project, whoever sponsored the bear owns the bear...forever. 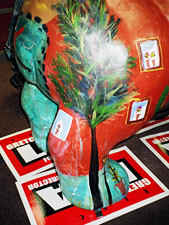 Thus, since Herb Real Estate sponsored Mrs. Strawser's bear, it belongs to Herb Real Estate. So, Bertoia Studios bought a Bear Fever bear so that Mrs. Strawser would have one to sell to her admiring fan! Bear Fever was excited to know that one of its artists is in such demand and that there are folks outside of our community excited about our project.